Following quick Senate action on Tuesday, and after surviving a close procedural vote on the Rules for debate, the House of Representatives passed the Farm Bill conference report on Wednesday by a vote of 369 to 47. The measure now heads to President Trump for his signature. 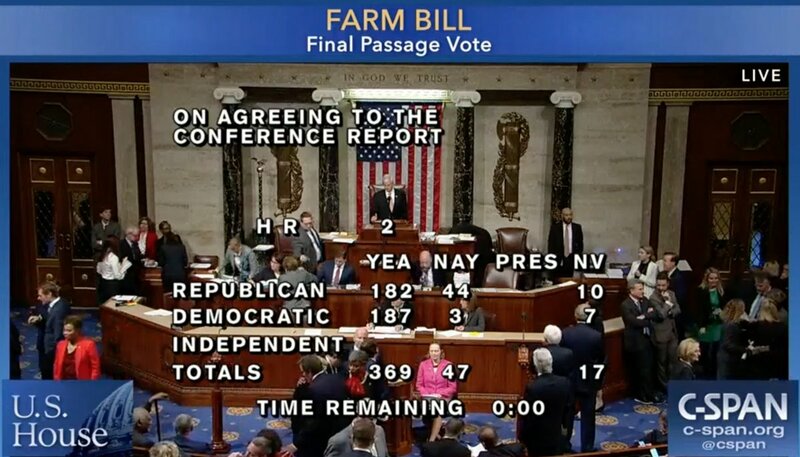 The Farm Bill Conference Report passed the House of Representatives on Wednesday by a vote of 369-47. More Democrats than Republicans voted for the farm bill. 44 Republicans voted against and three Democrats (Kind, Blumenauer, Doggett). The final bill doesn’t alter SNAP benefits or change eligibility for the program in any significant way. “House Republicans, who passed their original bill in June by just two votes after the bill had failed a month earlier, lost leverage in negotiations after the midterm elections. With Democrats set to take control of the House next month, Republicans had to fold on SNAP if they wanted to get a bill done,” the Politico article said. 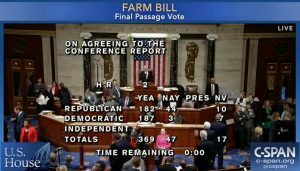 🚨 PASSED: House approves #2018FarmBill. Next stop➡️ president’s desk. “The bill met with opposition from Senator Chuck Grassley, an Iowa Republican, who advocated for a provision to tighten subsidies for farmers. Instead, the bill expands the definition of family members eligible for subsidies to include first cousins, nieces, and nephews. “Final passage in the House came after Republicans attached an unrelated provision that blocks lawmakers from forcing the chamber to vote on certain Yemen legislation until a new Congress takes over in January. The provision limits lawmakers’ efforts to push back on the U.S. role in Yemen’s civil war and relationship with Saudi Arabia amid bipartisan anger over the killing of journalist Jamal Khashoggi in the kingdom’s consulate in Istanbul,” the Bloomberg article said. This Yemen provision made the vote on the Rule governing the debate on the Farm Bill Conference Committee very close, 206-203. If this procedural vote had failed, the House’s consideration of the Farm Bill Conference Committee report could have been more complicated.